Many women want something to throw over their swimming costumes that will give them a bit of coverage. But did you know that the style and shape of the cozi cover-up can make a big difference to your beach or pool look? In this video I show you what to look for in a chic cozi cover-up this summer. 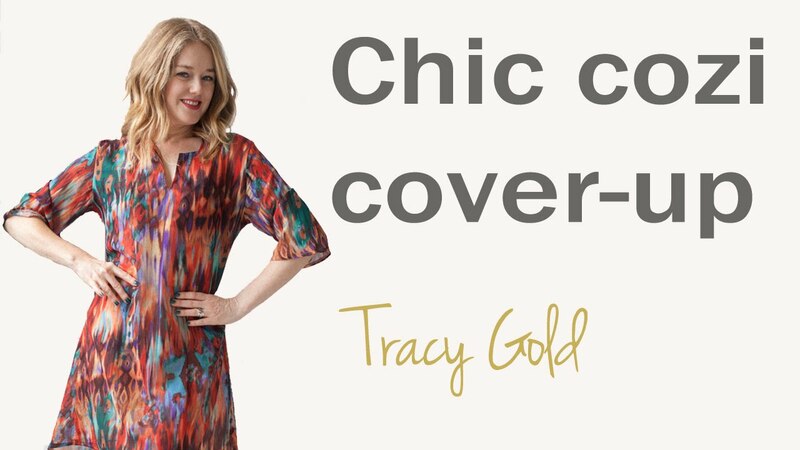 In this video Tracy Gold shows you what to look for in a chic cozi cover-up this summer. Most women tend to go for baggy styles, like a kaftan, in order to cover up. A baggy style often makes you look bigger than you are. So what is the alternative? Rather select a style that has shape in the waist. It can still be loose fitting and comfortable, but a little bit of waist definition will make a big difference to your look. Also remember that a print is often better than a plain. The print disguises the eye so you won't know what is fabric and what is flesh. An added benefit to a cozi cover-up that has some shape, is that you can dress it up and wear it as a dress. Simply add a slip, a belt, some shoes and you are ready to go out. This means you get more wear for your spend and it takes up less room in your suitcase.